Indonesia will "recognize, respect and protect" the rights of traditional forest users, including indigenous people, as it works to slow deforestation, reports the Rights and Resources Initiative, a coalition of NGOs. Speaking at a forestry conference in Lombok, Kuntoro Mangkusubroto, head of the Indonesian President's REDD+ Task Force, said the government would immediately work to implement a decade-old law that requires recognition of adat or customary rights. The effort will include developing a land tenure map so government agencies can better understand how communities are using land and delineating the legal status of the Indonesia's forest area. Only 12 percent of the Indonesia's forest area has been legally delineated, according to Kuntoro. Land tenure issues have long plagued the forestry sector in Indonesia. The bulk of Indonesia's forest is owned by the state, which historically has doled out large concessions - often tens of thousands of hectares in extent - to logging companies. 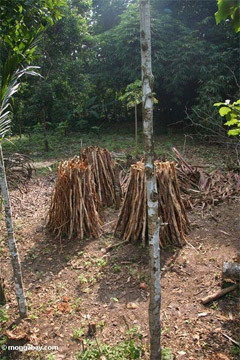 Local communities mostly lose out, leaving some to seek opportunities from illicit timber harvesting. Without clear ownership rights to land, communities have little incentive to reject illegal logging or manage forests for the long-term. The model - which has contributed to the abandonment of traditional land stewardship in many areas - has driven large-scale devastation of Indonesia's rich forest ecosystems. Kuntoro highlighted this problem in his speech, noting that according to a recent government study, about 20 percent of all villages in Indonesia are located within forest lands claimed by the government as part of its Forest Estate. "So, it can be argued as illegal because they live on state land," Kuntoro said. "However, people from the village will claim that they have lived there for generations. "Because of this, land tenure conflicts happen and can create uncertainty for development purposes." Bundles of wood in Java. Kuntoro's speech came a day after Indonesia said it would more than double the the land currently under community-based forest management by granting 89,000 hectares of forest permits to communities. Even with that expansion, less than 1 percent of Indonesia's forest land is under community-based forest management. Nevertheless the move was welcomed by community rights advocates and environmentalists. "This represents a tipping point in Indonesia's policies toward the rights of the people who live in and around the nation's forests," said Iman Santoso, coordinator of a group of experts that is working to resolve the Indonesia's forest tenure issues. "Because Pak Kuntoro represents the President, this means that all government agencies will have to align their policies with the directives communicated today." "This is a watershed moment for the people and forests of Indonesia as well as the future health of our global climate," added Lafcadio Cortesi, forest campaigner at the Rainforest Action Network. Cortesi said a recent visit to a remote village in South Sumatra showed the potential of community-managed forest areas - known as Hutan Desa under Indonesian law - to support sustainable local communities. "Hutan Desa holds significant promise for improving the livelihoods of Indonesian forest communities while maintaining Indonesia's priceless ecological, cultural and climate values." "Our experience in the field yesterday and working with customers that buy forests products, suggests that certainty around land status and tenure is a crucial element for ensuring Indonesia becomes a go-to supplier for the international marketplace," he continued. "Hutan Desa and implementation of the legal requirement to identify existing land claims over areas in the national forest estate are two vital elements for creating such certainty." "Indonesia will also need to develop and implement new policies and exercise concerted political will in order to meet its economic and carbon emission reduction targets."